WinPalace Casino Review - Is WinPalace Legal For US Players? WinPalace is an online casino that has been operating since 2009, where players from around the world can sign up and join to play the more than 120 slots, table games and more. Licensed in Curacao, WinPalace caters to many countries - including the United States where U.S. players in just about every state can sign up and play providing they meet the legal age requirement. LegalCasinosUSA.com has some great information on Win Palace and how residents in the U.S can create accounts and start winning real money today. The signup process at WinPalace is simple, straightforward, and coincides with just about every online casino signup process you will come across. It starts by selecting a login name and password, followed by basic personal information. You will need to verify who you are, which is just a security precaution that is taken - online casinos take security very seriously. Information such as your name, address, email, country, and phone number will be needed to begin your account. From there, you will need to agree to the terms and conditions of WinPalace. Finally, click create your account and you are on your way. You must be at least 18 years old to play at WinPalace - but if your state's gambling age is 21, you must meet that requirement. We are going to answer this question from a USA player's perspective. After all, you are on a USA casino review site. It's important to distinguish that we are U.S. residents because it affects the methods that players can deposit into their accounts to fund them. At WinPalace, they have a banking section complete with the list of depositing options that they offer. There are seven listed, of which two can be methods for U.S. players. These are Visa and MasterCard credit cards. Credit cards are the most common methods of funding you will find across the board, as they are widely accepted at casinos. But even though USA players can use them, they can be finicky. That's because some banks backing the cards sometimes do not allow for online gambling transactions. This is not always the case, but it could present some problems. Unfortunately at WinPalace, players from the U.S. only have the credit card option of Visa and MasterCard though. One of the cool features of all online casinos are bonuses. These bonuses give players free cash to use on games, usually broken up into different categories. But if you're looking for the best bonus at WinPalace, you cannot go wrong with our exclusive bonus for those who want to deposit to play slots for real money. When using the bonus code "4000FREE" (shown right), qualifying deposits will be quadrupled to a maximum of $4,000 in slots bonuses. Of course, you will not have to deposit that much to take advantage of this offer but it is nice to know exactly what you need to do to get the full bang for your buck! Just below, we've taken the time to highlight a few of the other bonuses that aren't as good as this one, but they are ones that do have more flexibility in terms of games that can be played. Do know that WinPalace has special bonuses just for games like blackjack + video poker which is hard to find. 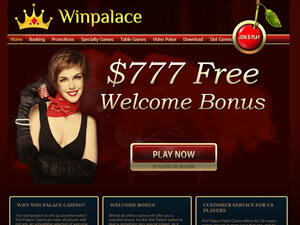 WinPalace offers a $1,000 welcome bonus using the bonus code PALACEWELCOME. The bonus code is plugged into your account by the cashier - should the player opt for the bonus (optional). This can be a bonus spanning your first two deposits. As with all casino bonuses, rollover requirements are present - a 30X rollover in this case. Over 130 casino games are offered at WinPalace - spanning slots, craps, video poker, roulette, blackjack, keno, bingo, and more. WinPalace even allows non-members to preview the games that are offered, so that you can check out all that is available. Everything that you would expect a casino to have, Win Palace has + more. WinPalace Casino Software - What's Under The Hood? WinPalace uses Real Time Gaming software as their casino operations network. Casinos that run RTG online casino software have a reputation of being among the best and most trusted around. WinPalace certainly epitomizes why, providing all players with a great experience that you can see for yourself on site. The minimum withdrawal requirement at WinPalace is $100. Approval of a withdrawal can take up to 10 days, with WinPalace notifying you when they send out your winnings. For players in the United States, the option is a check through a courier - which can take up to three weeks to receive. WinPalace has an option for money to be wired directly to players' bank accounts. A live chat option is offered on the homepage of WinPalace, which will connect you to a customer representative to answer any and all questions. In addition to that, there is a Frequently Asked Question Section that goes over a variety of topics. Be sure to review this information to see if it covers your inquiry. If not, call WinPalace at 1-888-835-9940 or you can drop them email at support@winpalace.com.